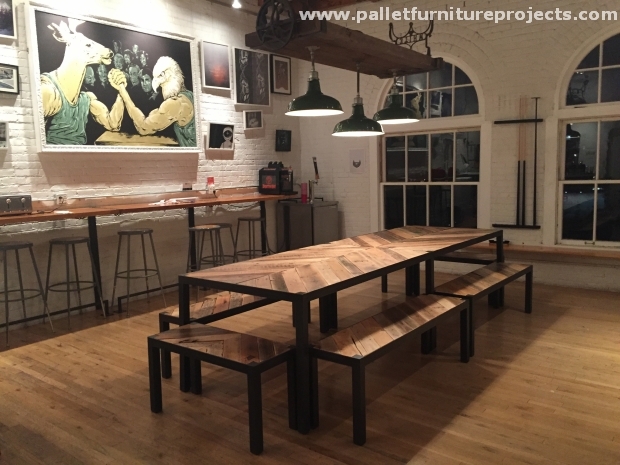 Some of the best wood pallet tables have already been recycled by us in some of the previous articles. 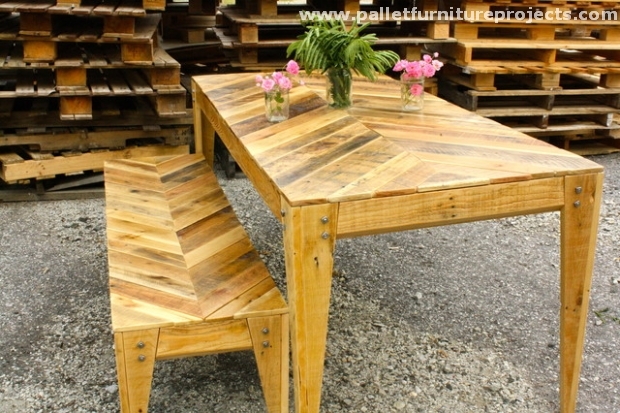 Let’s have a glimpse of chevron wood pallet tables. A chevron is basically a V shaped line or stripe, especially the one on the sleeves of a uniform indicating rank. 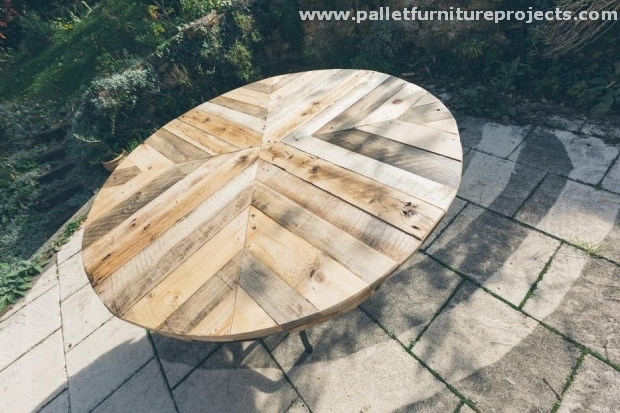 So what exactly could be perceived from this basic definition is that the wooden pallet tables having V shaped wood pallet planks on the top are named as the wood pallet chevron tables. So basically the idea is that there might be any shape or design of the table, but the front pattern of pallet planks would be V shaped. This is always a great idea to start with some outdoor furniture item. Because you have to arrange a large number of wooden furniture items for your outdoor according to the space available outside. 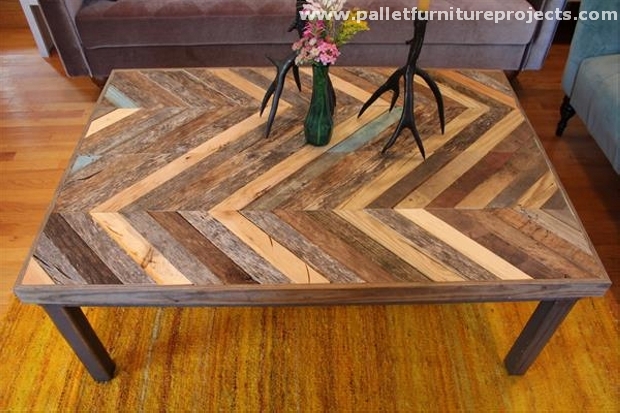 So this chevron wood pallet table with reclaimed legs is just a starter. 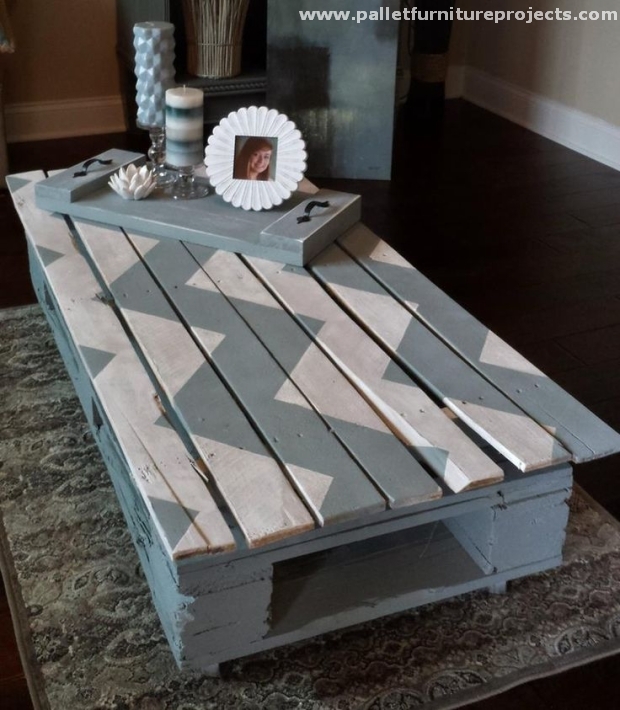 This is a cute wood pallet chevron coffee table. We can see a certain V shaped pattern on the top of the wooden coffee table. Pallet planks are cut from the top in a declining shape and two inward declining shapes are joined together to make this chevron pattern. 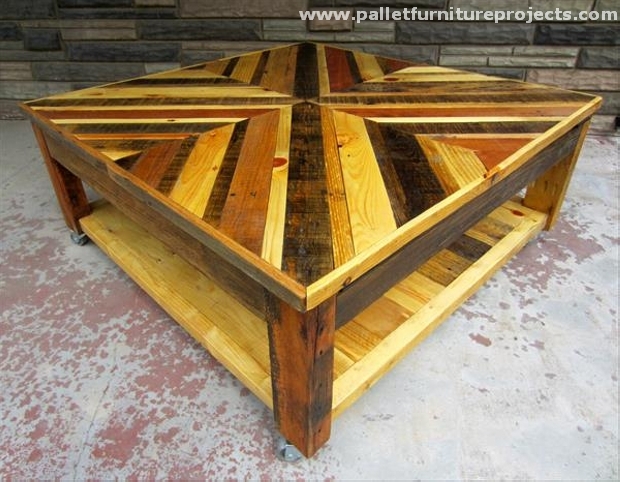 This is again a wood pallet chevron coffee table with a beautiful dark brown stain. 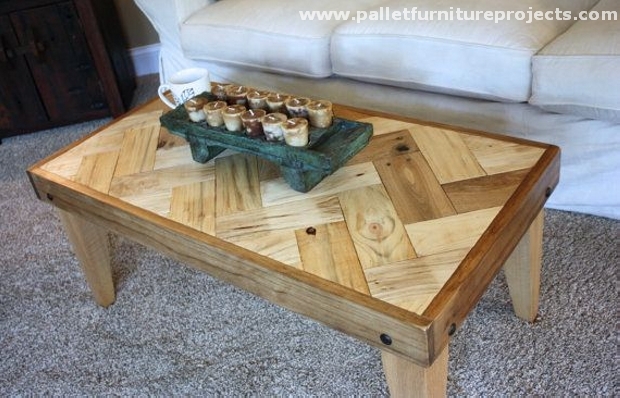 Though the simplest design is used in making this wood pallet coffee table, but a lot of beauty is added with the help of chevron pattern and dark brown stain. If the delicacy and sophistication is something quite close to your nature, going for this chevron wood pallet coffee table would be the most appropriate choice to opt for. Just look at the decent appearance of this chevron pallet coffee table along with a sleek bench. A complete package for your outdoor. Every time we think about some decent wooden furniture items about our home interior, the wood pallet creations have always been our top priority. As the pallet creations are cost effective, they are designed according to our choice, and we can stain them matching to the rest of home interior. 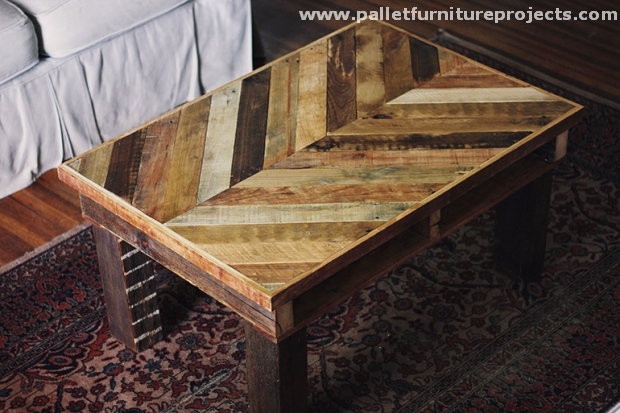 Here is another classic example of a wood pallet chevron table. Though the timber used in its frame is a bit deteriorated, nail marks are pretty obvious on the surface, still the wood pallet coffee table is quite worth being placed inside your bed room or lounge. A dining table is given much importance among other wooden furniture items as it provides with a platform which is a sort of family reunion three times a day. Just to make it much prettier, we made this chevron wood pallet dining table following the certain pattern that is quite prominent on the top of table. 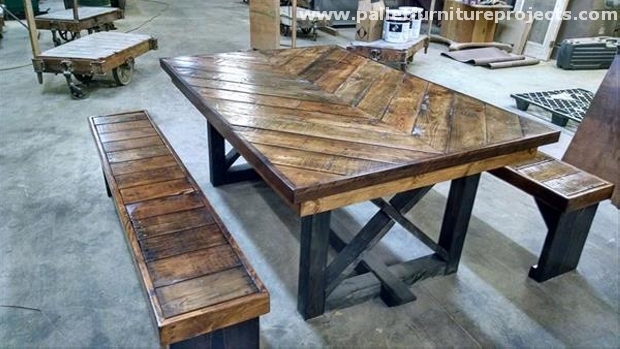 Just by adding some extensive creativity and innovation, you can come up with some of the astonishing wood pallet items. 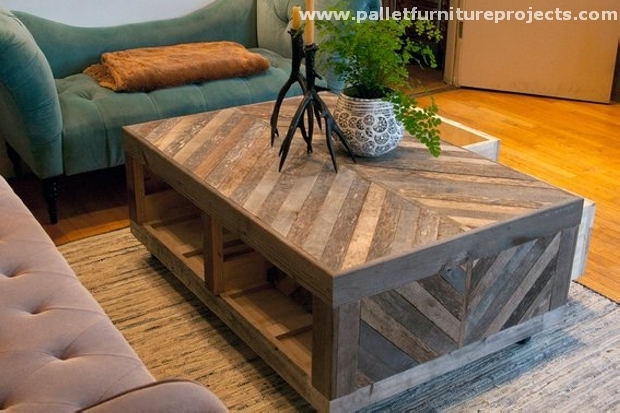 As you can see here in this specific project, this portable chevron wood pallet coffee table is a very unique and smart addition to your home interior. As we know that wood pallet planks might carry different wood colors or shades. Though they all belong to the brown family with some darker or milder shades, so if we use them in any project and leave them unstained, this generates a beautiful contrast of different shades of natural wood colors. 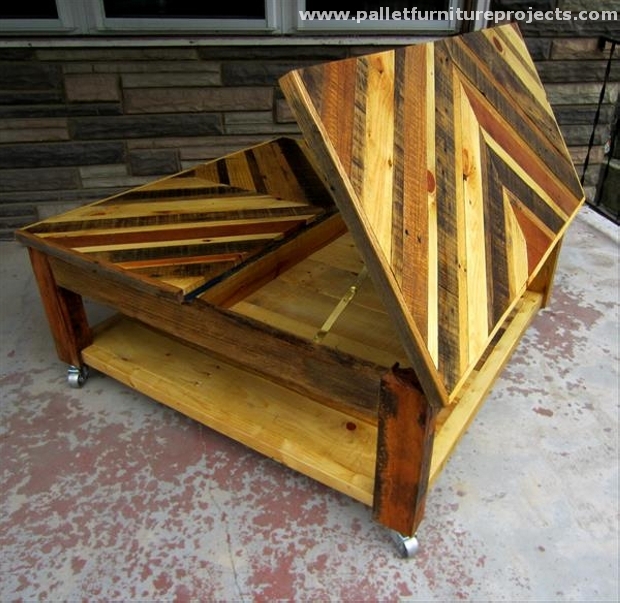 This is a complete set up or package of a wood pallet chevron table along with two similar wooden benches. This could best be used outdoors, in your green landscape or even in your patio. Enjoy your meals sitting on this or have some gossip spells with family and friends. This one is my favorite. 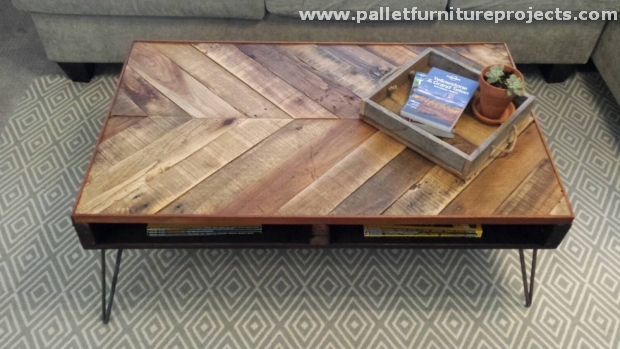 This wood pallet chevron coffee table is a great demonstration of delicacy and decency. 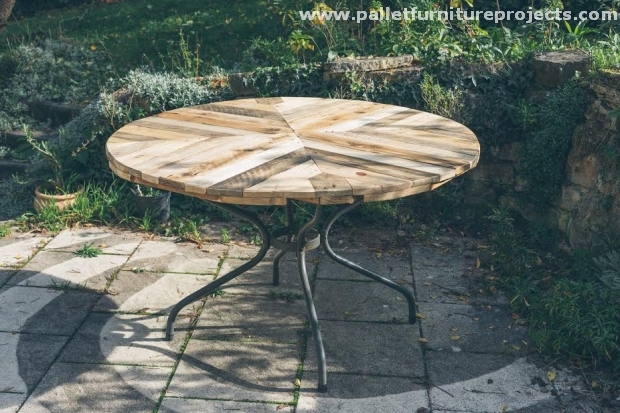 Its metallic reclaimed legs are a prominent feature, while the rounded and sanded corners are an obvious edge over the other wooden pallet chevron tables that we have seen so far. I remember we used to see this kind of wooden tables at my granny’s house in the countryside. This vintage table has the simplest shape or design, while the chevron pattern on the front still makes it worth being considered. This is again a smart choice for some outdoor usage. How do you find this one? 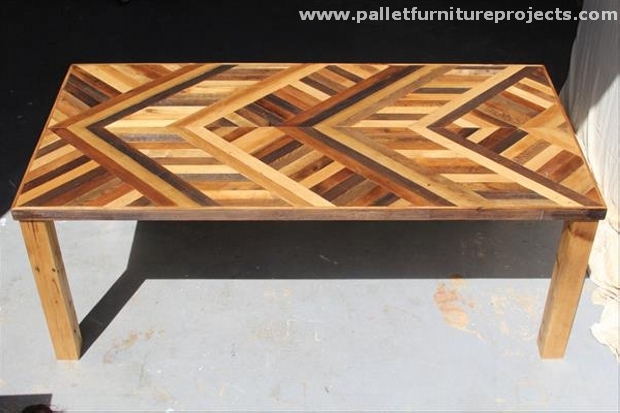 There’s something clearly different in this wooden pallet chevron coffee table, in the earlier tables the chevron pattern was applied on the cut wooden planks, while in this one those V shapes are drawn on straight wood pallet planks with some fine brush strokes. Color exploitation can always be a major component in the beauty of wooden furniture items. Combination of different color shades can turn an ordinary furniture item into a beautiful wooden object. 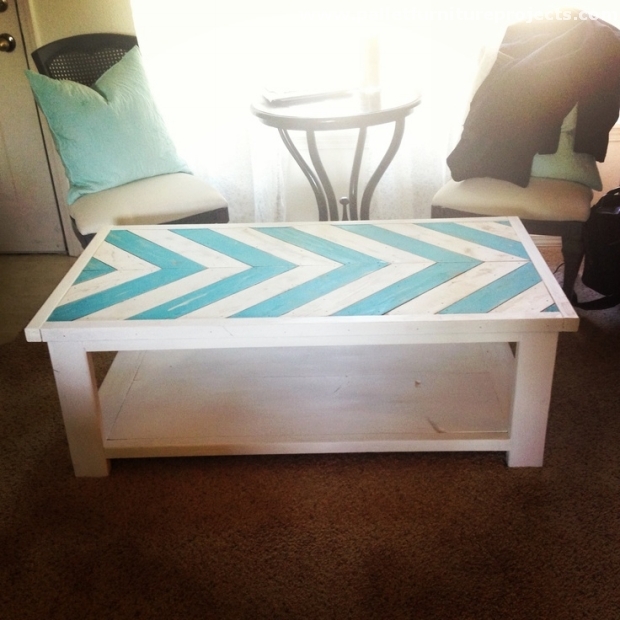 Same could be observed in this white and blue painted wood pallet chevron table. All of the chevron table patterns that we have presented here in this article are mostly left unstained except a couple of tables. This is just because the chevron pattern is itself an embellishment for the wooden pallet tables. 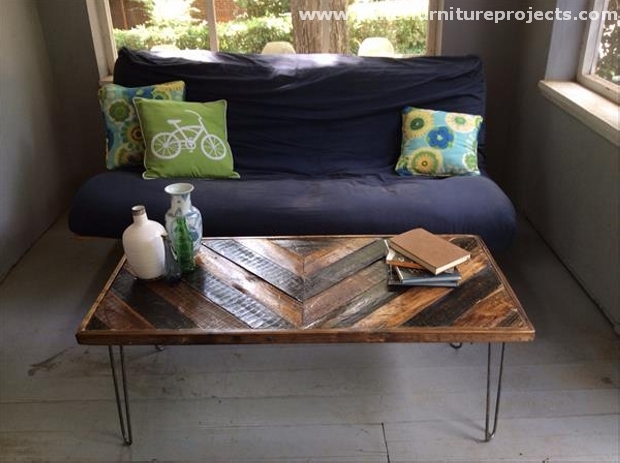 Like this rustic wood pallet coffee table. Its huge metallic screws on lower corners give an industrial touch. 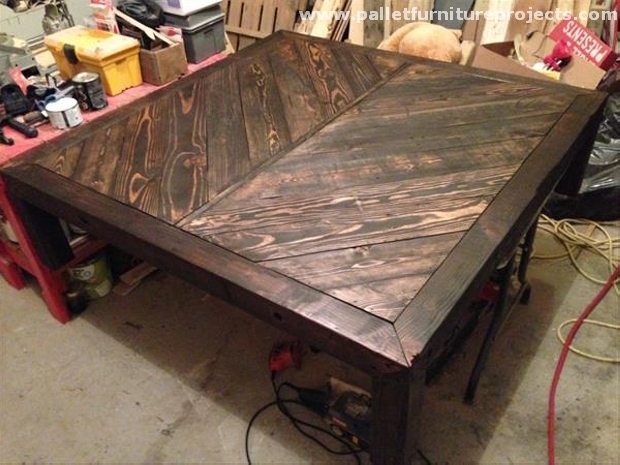 So working so extensively on these pallet wood chevron tables was really a great and exciting experience. This final one is also very smartly made using the rustic wood pallet planks. Its top is quite spacious which makes it useful in various situations and could best be used outdoors.